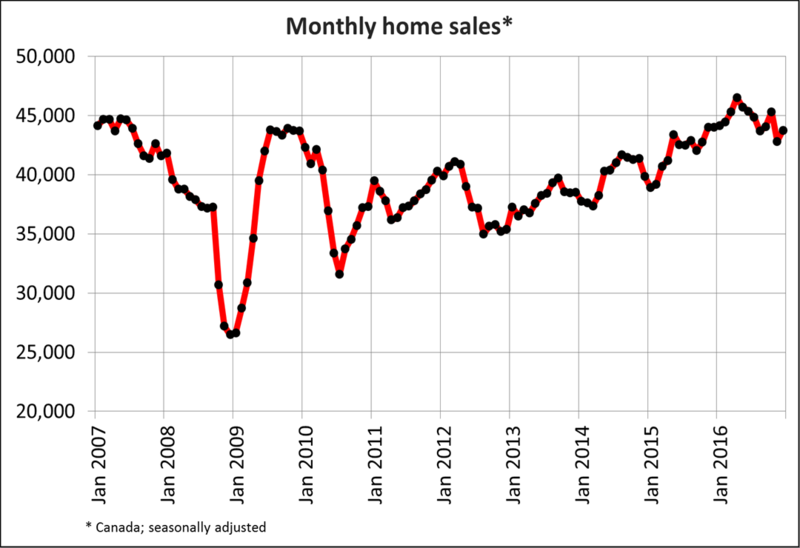 Ottawa, ON, January 16, 2017 – According to statistics released today by The Canadian Real Estate Association (CREA), national home sales were up on a month-over-month basis in December 2016. The number of homes trading hands via Canadian MLS® Systems rose 2.2 % month-over-month in December 2016. The rebound recovered less than half of the drop in activity from October to November, when it posted the biggest monthly retreat in more than four years after tightened mortgage regulations came into effect. Activity was up on a month-over-month basis in about 60% of all local markets, led by Calgary and Edmonton where sales rallied following large declines in November. Actual (not seasonally adjusted) sales activity was down 5.0% in December from a year ago, when it reached the highest level ever for the month. The number of homes changing hands in 2016 was up by 6.3% annually, reflecting strong sales activity in the first half of the year that has softened since. The number of newly listed homes fell 3.0% in December 2016 compared to November. New listings were down in about 60% of all local markets, with sizeable declines in B.C.’s Lower Mainland, Calgary and the Greater Toronto Area (GTA). With sales up and new listings down, the national sales-to-new listings ratio rose to 63.5% in December compared to 60.3% in November. A sales-to-new listings ratio between 40% and 60% is generally consistent with balanced housing market conditions, with readings below and above this range indicating buyers’ and sellers’ markets respectively. The ratio was above 60% in more than half of all local housing markets in December, the vast majority of which are located in British Columbia, in and around the GTA and across Southwestern Ontario. There were 4.6 months of inventory on a national basis at the end of December 2016 – down from 4.8 months in November. The Aggregate Composite MLS® HPI rose by 14.2% y-o-y in December 2016. The increase has diminished in recent months (14.4% y-o-y in November; 14.6% y-o-y in October) due to softening price trends for single family homes in B.C.’s Lower Mainland. Price gains remained strongest for two-storey single family homes and townhouse/row units (16.1% y-o-y and 15.4% y-o-y respectively), followed closely by one-storey single family homes (13.3% y-o-y) and apartment units (12.0% y-o-y). 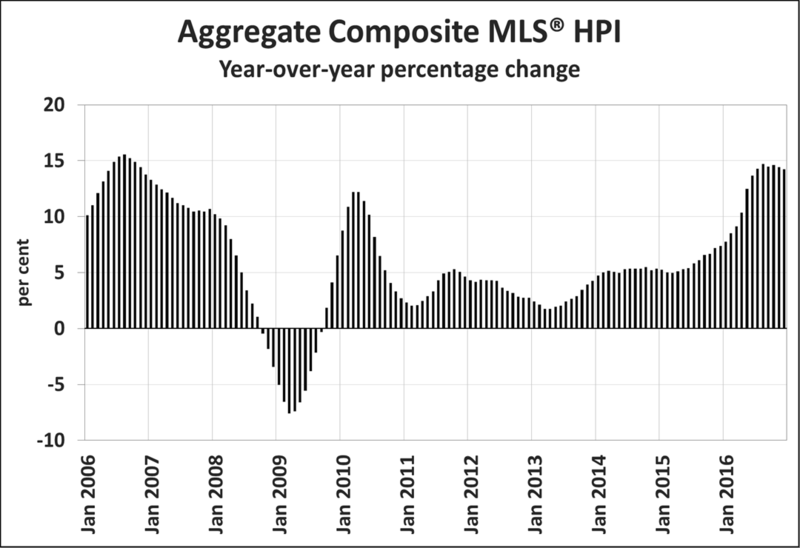 While benchmark home prices were up from year-ago levels in 9 of 11 housing markets tracked by the MLS® HPI, trends continued to vary widely by location. In the Fraser Valley and Greater Vancouver, prices continued to recede from their peaks reached in August 2016 but remained above year-ago levels (+27.0% y-o-y and +17.8% y-o-y respectively). Meanwhile, benchmark prices climbed to new heights in Victoria and elsewhere on Vancouver Island, and in the GTA. By comparison, home prices were down 3.7% y-o-y in Calgary and edged lower by 1.6% y-o-y in Saskatoon, continuing their retreat from peaks reached in 2015. The national average price continues to be pulled upward by sales activity in Greater Vancouver and the GTA, which remain two of Canada’s tightest, most active and expensive housing markets. That said, Greater Vancouver’s share of national sales activity has diminished considerably over the last year, giving it less upward influence on the national average price. The average price is reduced by almost $120,000 to $352,513 if Greater Vancouver and GTA sales are excluded from calculations.